Dude Wipes 30 PackView larger Toilet Paper + Dude Wipes = King of the ThroneView larger What are Dude Wipes? Dude Wipes are the first flushable wet wipes made for Dudes. Use them as part of your bathroom routine and you'll never turn back. They are great for a quick clean up of your face, hands, armpits, and dude regions. The Dude Products Story Back in the day, we founded Dude Products out of our apartment in Chicago. Whether it was some unexpected physical activity or the aftermath of the lunchtime burrito, we realized that as guys, we are destined to smell and something needed to be done. So on behalf of Dudekind, we created Dude Wipes to combat stink and put you back on your game wherever or whenever nature calls. 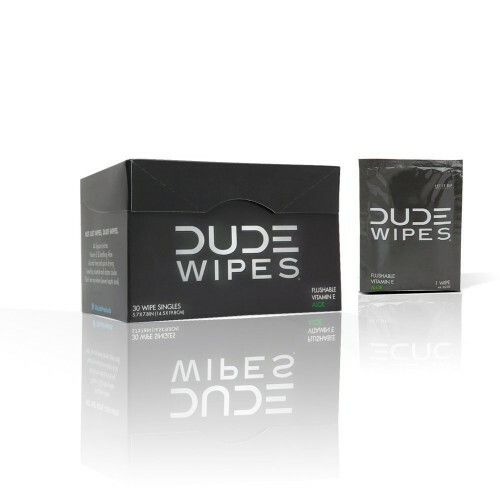 Give the Gift of Dude Send your favorite person a box of Dude Wipes. Are they just for Dudes? Of course not! Dude Wipes don't discriminate. We work for Little Dudes, Women, and Dudettes. You name it, and we've kept them fresh. The Dude Wipe More Than Your Average Wipe.